Early in 1948, MP ordered three "Planetarium" domes from Budd as part of a $14 million upgrade of the "Eagle" fleet. 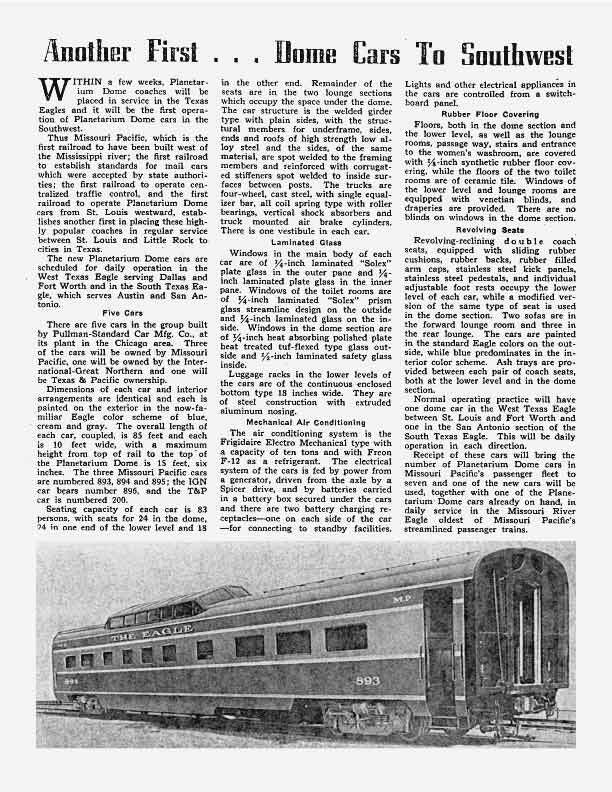 Two of the cars (890-891) carried "Colorado Eagle" on the letterboards, and were used primarily on that train, although they saw some use (as early as 1948) on the "Texas Eagle" and possibly other trains. 892 was delivered with "The Eagle" on the letterboards. In 1952 the first 2 cars were relettered "The Eagle" to give MP more flexibility in train assignments. 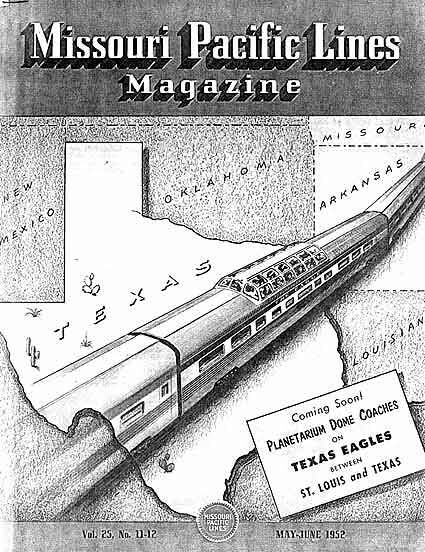 In 1952, Pullman Standard delivered 5 more domes to MP, 3 with MP ownership and one each for subsidiarys International-Great Northern and Texas & Pacific for regular service on "Texas" and "Missouri River" Eagles. MP 890 - (Budd) MP 590 (1963), IC 2200 (6/67), retired 2/70, William Langhoff Chicago IL for dinner club/nightclub, 1971 to CHalP (Mexico) 521 "Ciudad de Chihuahua", FNM (1986) - car painted FNM blue - stored 1989, "major" fire reported circa 1995 while stored at Aguscalientes shops, sold to "private party" 1996 (scrapper?) - current status unknown. MP 891 - (Budd) MP 591 (1963), IC 2201 (6/67), retired 2/70, reported in PTJ to be named "Arlo Guthrie" but photos later at Butterworth showed faded IC colors and no name, William Langhoff, J H Clark, Butterworth Tours, Golden Arrow (lease), Roaring Fork RR (1986), Denver Railcar DRCX 7891 "Maroon Bells" (converted to diner) (800023), Texas Southern lease - (1989), Texas Limited Houston-Galveston (lease), DRC Railtours (1994), 1995 to Mexican American Railway division of MARA operating on the South Orient Express Mexico Copper Canyon tour service - car based in Chihuahua MX. As of 2001, service terminated and car withdrawn from Mexico. Car part of the short-lived "Acadian" Montreal - Maine - Halifax service. Car sold 5/04 to Philip Sheridan and moved to ITAC. Car sold again 12/04 to Delaware & Ulster RR Arkville NY for use on the 'Rip Van Winkle Flyer'. MP 892 - (Budd) MP 592 (1963), IC 2202 (6/67), retired 12/71, Heart of Dixie Chapter NRHS (1971) - car in excursion service Calara AL (Heart of Dixie RR Museum). MP 893 - (PS) MP 593 (1965), to IC as a parts car (6/67) - not numbered - scrapped at Burnside shops 1971. MP 894 - (PS) MP 594 (1963), IC 2210 (6/67), retired 12/70, Cobbs/Allen/Hall (Attys) Mobile AL (1971), Butterworth Tours (1976) - leased to Golden Arrow as quasi NYC "Hazel McLean" early 80's, then Butterworth "Little Crow", David Paradeu "St Croix" for Minnetonka Zephyr Dinner Train (1988) - then Minnesota Zephyr Dinner Train - car in service in Stillwater MN. Tracks ripped out in 2007 and car is now a stationary restaurant in 2008. MP 895 - (PS) MP 595 (1962), retired 1967 at Sedalia MO shops, sold to scrapper 1970 - car pushed over on its' side - languished there until repossesed and resold in 1980 to a different scrapper, car finally scrapped 1985 at the (then) UP Sedalia shops.